WELCOME TO THE AUGUST EDITION OF THE GO TEXAN ROUND-UP INFOLETTER. As summer starts to wind down in Texas, it’s time to start getting excited about the State Fair of Texas – the biggest state fair in the nation. The good news is there is still time for GO TEXAN members to get involved. 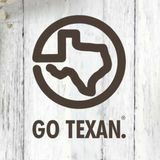 Be sure to check out page 8 and find out how you can be a part of our GO TEXAN Pioneer Brand General Store inside the GO TEXAN Pavilion, where you’ll find a large collection of some of the best products made right here in Texas. We are thrilled to have the opportunity to promote the excellence and entrepreneurial spirit of our GO TEXAN members. From the finest in Texas food, wine and restaurants to communities and products, each issue of this electronic magazine is geared towards helping you stay up-to-date with helpful information regarding news, events and opportunities that might assist your company. 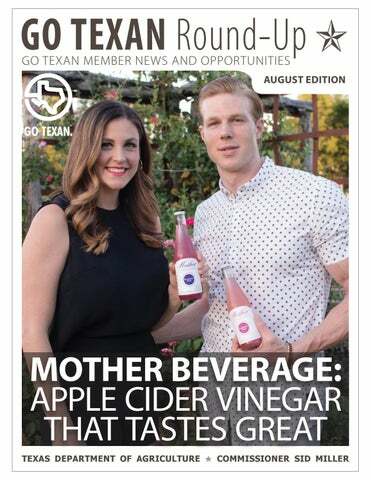 MOTHER BEVERAGE: APPLE CIDER VINEGAR THAT TASTES GREAT Husband and wife team Stephen and Allison Ellsworth created a beverage they loved so much that they knew they had to share it with others. The beverage was an apple cider vinegar (ACV) that they began drinking to help them detox and â&#x20AC;&#x153;resetâ&#x20AC;? their bodies. They loved the way drinking ACV made them feel, but they were put off by the taste. in December 2015, but it has already grown in the Dallas and Southern California markets. They are currently in Whole Foods stores in the Dallas/ Fort Worth area and were crowned Best New Beverage in Santa Monica, California, by BevNET at the 2016 new beverage showdown. Mother Beverage continues to produce their drinks in their own facility in small batches to ensure the highest quality and care in each bottle. “Mother Beverage pairs well with almost anything,” Ellsworth said. “Customers tell us they love drinking one after a big meal, as it helps aid in digestion. They also tell us that they are using them as a low calorie, low sugar cocktail mixer. The options are endless.” Mother Beverage prides itself in being a GO TEXAN member, and building something with and for their family. The Ellsworths perform all the work for their small but growing company — from making the infusions, bottling the product, selling, demoing and office work, but they’re not complaining. They know that not having a giant corporation and brand recognition behind them means they have to work twice as hard. While Ellsworth created every flavor they offer and thus loves them all, as of late, she has been grabbing the Lime Ginger drink, which is one of their top sellers, and Raspberry Rose. more information, contact Tina Matteri at (866) 618-3434 ext. 416. What: PLMA Show When: Nov. 12-14 Where: Chicago, Illinois Details: This event organized by the Private Label Manufacturers Association (PLMA) has linked retailers and suppliers for over 30 years. There is a growing trend among consumers favoring private label goods, as these are considerably more accessible. Moreover, products listed as private label goods are seeing growth in both market share and units sold across various distribution channels such as drugstores and supermarkets. This market segment has great sales potential for SUSTA region companies. Best prospects include but are not limited to: glutenfree, GMO-free, beverages, ethnic foods, snack foods, nuts, condiments, seasonings and sauces, organic products, specialty meats and dairy products. The deadline to register is August 18. For more information, contact Carlos Guerrero at (512) 463-6507.
to broaden their culinary experiences and tastes by consuming more western food products. In 2016, 53,295 visitors attended Food and Hotel China from both China and overseas. Most of the visitors are decision makers within their respective industries, with 42 percent retailers, 23 percent importers and distributors and 18 percent belong to the hospitality sector. Registration ends August 11th. For more information, contact Carlos Guerrero at (512) 463-6507.
export. Exhibit with SUSTA at Gulfood, the largest food, drink, food service and hospitality show in the Middle East. In the past, almost 5,000 exhibitors from roughly 120 countries showcased their products, highlighting the international appeal of this particular trade show. Certification of eligibility for 2018 events begins August 1, while registration for events opens August 1. Spots fill up very quickly. For more information, contact Carlos Guerrero at (512) 463-6507. What: FOODEX Japan When: March 6-9 Where: Tokyo, Japan Details: Japan is one of the best food and drink markets in the world; the total value of the market is around $584.45 billion USD (combining food retail and food service sectors). In 2014, the U.S exported $13.9 billion USD worth of agricultural and fish products to Japan. Exhibit with SUSTA at FOODEX and be a part of the largest food and drink exhibition in Asia. This 4 day event brings together about 77,000 buyers in one of the best environments to conduct business. Aside from the number of Japanese buyers who will be attending this event, FOODEX is a great opportunity to enter the food and drink market of East Asia. Certification of eligibility for 2018 events begins August 1, while registration for events opens August 15. For more information, contact Carlos Guerrero at (512) 463-6507. Pinkertonâ&#x20AC;&#x2122;s Distillery was featured on The Agriculturist. Congrats to Pappas Bros. Steakhouse, who was named Grand Award winners in Wine Spectatorâ&#x20AC;&#x2122;s Restaurant Awards for their uncompromising, passionate devotion to the quality of their wine program. Loam Agronomics was spotlighted on Click2Houston. Your free classified ad section to advertise your service/product to other members. In search of a service or product that a GO TEXAN member already provides? Find it by networking here. If you have something to list here, email the info (50 words or less) to us, and we’ll include it here in the next infoletter. Post #1 U.S. Dept. of Agriculture (USDA): America’s farmers and ranchers will soon have the opportunity to strongly represent agriculture in their communities and industry by taking part in the 2017 Census of Agriculture. Conducted every five years by USDA’s National Agricultural Statistics Service (NASS), the census, to be mailed at the end of this year, is a complete count of all U.S. farms, ranches, and those who operate them. So, when you get the census in the mail, please fill it out and send it in! Your fellow farmers depend on it. Watch the video at left for more information. Post #2 Quality Brand Promotions: Looking for professionals to sample your product at an event or retail store? Quality Brand Promotions specializes in tastings for spirits, wine and beer as well as specialty foods in Texas. During the months of August and September, they will offer interested GO TEXAN members a 10 percent discount on copromotions of alcoholic beverages with specialty food products and alcoholic beverages from two suppliers. To explore more options or for more information, visit their website or contact Thomas Simon at (512) 491-7911. Post #3 U.S. Dept. of Agriculture (USDA): Attention all GO TEXAN producers: USDA is seeking comments on a proposal for a new industry-funded research and promotion program. Click here to learn more. Exclusive communication for GO TEXAN members, with the latest information, news, events and opportunities for members.